7:45 – Upon waking, I filled my mason jar with 1 litre of water and some lemon to add a bit of flavour and cleanse my system. I also opted for a Yogi Tea sweet chai (caffeine free) tea as it was pretty freezing in Brizzle today. 9:00 – I went for a 3 mile run. 10.00 – I got home and juiced a massive cucumber which I mixed with about 1.2 litres of orange juice for a super delicious refreshing breakfast. This equates to about 500 calories. 14.00 – For lunch I had a 9 banana smoothie. Yummers. Then for lunch part 2, I had this huge salad with pomegranate, orange and peppers. About 1100 calories. 19.00 – Dinner time! 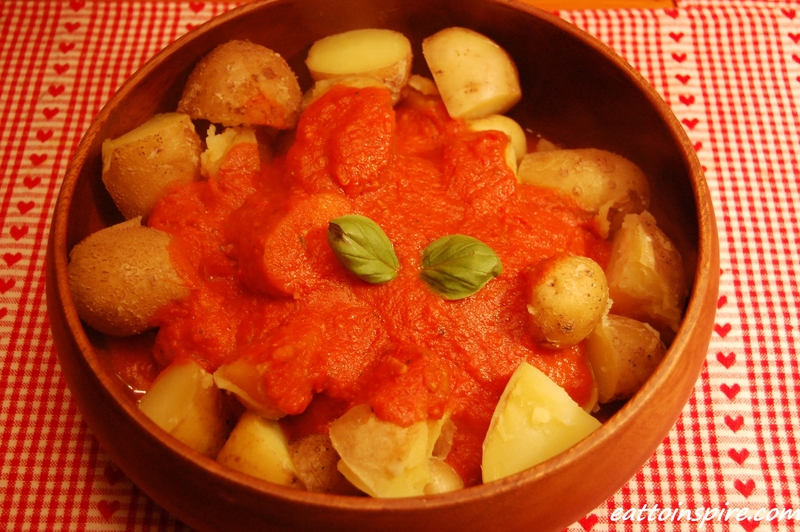 I boiled 1kg of organic potatoes and topped this with home made tomato sauce (used only a tiny amount of oil in this). Approx. 1000 calories. 21.00 – Hot cocoa. I’m not perfect! I made this using 3tsp cocoa, 1tsp organic sugar and a bit of organic soy milk. Yum. Yes, I eat a lot! This means I have all the energy I need and more 😀 Eat big, live big. Throughout the day I also had a few cups of herbal tea and more water. I have consumed about 2600 calories today. Nope, I am not getting fat! On my days off (when I stay home) I tend to eat a much greater volume of food as I have the extra time to prepare and eat my meals. I will do another ‘what I eat’ blog soon about what I eat when I am busy or at work. Achievement of the day: completing knitting my first ever beanie hat. Expect to see me wearing this tomorrow 😀 I love it! What have you guys been eating today? I want to know! Hope y’all have had an amazing day! Man. I applaud the healthfulness! Also love the mason jar! Thank you so much 😀 Comments like this make me happy!! Hope you are having an amazing day!